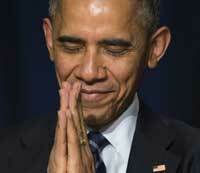 Online Comment: Evangelicals are mad at Obama for accurately recounting history. For people who are so bent on calling everyone "sinners" it just seems odd to me that they are less willing to call their own tribal members in history "sinners." Paul said he was the "chief." Question for evangelicals: Did Christians ever justify slavery or Jim Crow in the name of Jesus and "the gospel?" Yes or No? Read more about Are Evangelicals Upset with Obama for Accurately Recounting History? There is a great deal of historical revisionism and hatchet jobs regarding these events which need to be utterly debunked. During the time of the Enlightenment up to recent time critics often claim that the Crusaders were Western imperialists, those who set out after land with a desire to loot. But there is a background that so many of the modern critics of the Crusades, for some reason, ignore: The history begins in the seventh century when conquering Muslim armies swept over the Middle East, North Africa, and southern Europe. One Christian land after another was mercilessly attacked and conquered by advancing Muslim armies. Vast stretches of once Christian lands were now in Muslim hands. The entire of North Africa, once solidly Christian now were under complete Islamic rule. It is important to remember that Muhammad told his followers, "I was ordered to fight all men until they say `There is no god but Allah.'" Just to show that his followers understood his words literally, it was a century after his death in which vast swathes of territory hung under the bloody sword of Islam. Under their rule there were gruesome tortures of Christian pilgrims to the Holy Land and vile desecrations of churches, altars, and baptismal fonts. 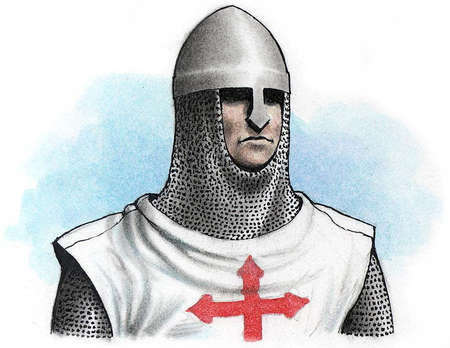 It is in this light of centuries of Islamic conquest, bloodshed and tyranny that the Crusades should be viewed. Read more about What About the Crusades? Tony Lane is professor of historical theology at the London School of Theology. He is a world-class Calvin scholar and author of several books, most recently Exploring Christian Doctrine: A Guide to What Christian Should Believe. The book is part of the Exploring Topics in Christianity series (includes one other volume at the present) which complements the Exploring The Bible series also published by IVP Academic. Like the other volumes, this one is very accessible. It is essentially a brief systematic theology in terms of topics covered, but far from typical in the way the material is presented. Maybe that’s a slight exaggeration. In any case, I was surprised at how some of the contents had shifted from what I consider a standard ordering. Lane first section (A), Method, is comprised of three chapters. The first is about knowing God, the second is about the Bible, and the third is about language about God. So far, pretty typical. Bonus points for having an actual prolegomena section in such a short systematic. It seemed to me that the only way I could know I was saved was by knowing the status of my eternal election. Was I chosen by God for salvation or was I eternally damned before I had done anything good or bad? To be sure, the Calvinist theologian in me had responses to this question, yet none of them sufficed…my Calvinistic theology presented my needs for assurance with an epistemological problem: in order to have assurance I needed to know the status of my election, something that by definition is secret and cannot be known. i) Calvinist Christians can know they are saved in the same way that Arminian Christians can know they are saved: by believing the Gospel. If it be objected that a professing Christian can be self-deluded, that's possible for Calvinists and Arminians alike. ii) In addition, it's demonstrably false that God's secret decree is by definition unknowable. For instance, past events are part of God's secret decree, but once they eventuate they are knowable. This objection was articulated in an article by William Lane Craig entitled “Lest Anyone Should Fall”: A Middle Knowledge Perspective on Perseverance and Apostolic Warnings where he essentially argues that the “means of salvation view” is actually more coherent in a “middle knowledge” perspective. Middle knowledge is the view of God’s knowledge that contains what his creatures would freely do in any given circumstances (or “possible world”) before he creates the world. Response: Indeed "whosoever will" is right... the thought of denying such an important part of Scripture never crossed my mind ...but if we are to honestly interpret the Bible we must declare the whole counsel of Scripture. The same Bible that teaches 'whosoever will' also teaches 'but men love darkness and hate the light and will not come into the light (John 3:19-20) and "the man without the Spirit cannot understand the things of the Spirit and thinks them foolish" (1 Cor 2:14) and "no one can say, “Jesus is Lord,” except by the Holy Spirit." (1 Cor 12:3). i.e. No one naturally submits to the humbling terms of the gospel. So I affirm, together with you, that whosoever will may come. But this is a conditional statement asserts nothing indicatively. "if you are willing", "if you hear", "if you do" declare, not man's ability, but his duty. "Does it follow from the imperative 'repent' that therefore you can repent? Does it follow from the command "'Love the Lord you God with all you heart' (Deut 6.5) that therefore you can love Him with all your heart? What do arguments like these prove, but that 'free-will' can do all things by its own power apart from the grace of God. Is that what you are trying to say? A good interpretation takes into full account all the Scriptures. Taking everything into account affirms that anyone who is willing may come but it also affirms that no one is naturally willing apart from grace. Most pastors develop a rhythm with their sermon preparation. You find a way that “works” for you and you pretty much stick with it. But until you have the pattern established, it can be messy. And one of the areas with which I struggled at the beginning was how prayer fit into my sermon preparation. 1. Lord, please help me to understand the meaning of this text and how it points to Christ. 2. Lord, please increase my love for the people who will hear this sermon. 3. Lord, please give me wisdom to apply this text to the lives of the people in our congregation. 4. Lord, please use this passage to help me grasp and love the gospel more so that I might help my hearers do the same. 5. Lord, please help me to see how this passage confronts the unbelief of my hearers. 6. Lord, please help me to be obedient to the demands of this passage. Help me to enter the pulpit having already submitted my life to this truth before I preach it. 7. Lord, by your Spirit please help me to preach this sermon with the necessary power and with appropriate affections. 8. Lord, please use this sermon to bring glory to your name, joy to your people, and salvation to the lost. There is nothing in the Bible which can remotely give the impression that some people are good and some people are bad, and being good is how we get God to accept us. We're all bad. The Bible draws a sweeping and devastating picture of human beings in Adam as corrupt, greedy, foolish, selfish, mean, envious, hateful, sexually perverse, cruel and violent. And even if we do not always exhibit all these characteristics outwardly, the germ of all these acts dwell in each heart. That is why those who declare that certain individuals are 'born this way' and so cannot change only understand half the truth. We were ALL 'born this way' captive to our lusts and corruptions and none of us can do anything pleasing to God to appease His displeasure with us (See Rom 1-3). This is no hyperbole. Our state is so hopeless that we can do nothing, except, by the grace of God, acknowledge that we justly deserve God's wrath save for Jesus Christ alone. Given that we are 'born this way' our only hope is to be born again... and since we cannot give birth to ourselves, this is only something God can do. "In the days of his flesh, Jesus offered up prayers and supplications, with loud cries and tears, to him who was able to save him from death, and he was heard because of his reverence." Did you read that? Jesus was heard BECAUSE of his reverence. He was not simply heard because He was ontologically righteous as the Second Person of the Trinity. But he was heard because he obeyed as a flesh and blood human being. So what? you say. 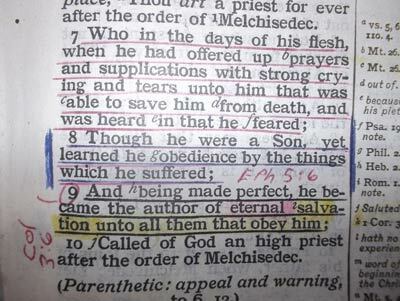 Well, this demonstrates that Jesus obedience as a human being, his life, not just his death was critical in our redemption. His obedience to God's law in his life was part of the righteousness that was imputed to us that we might be right before God. After gaining your composure, you realize your friend is likely color blind and unable to see the difference between orange and green. To him this orb in your hand is green and nothing you say is going to change that “fact”. He insists that the burden of proof is on you. In order for him to believe that this orange is actually orange you will have to prove it. Secondly, he insists that only six colors exist and every other “color” is just a myth created by the greedy tyrants at Crayola. Lastly, he cares little about what others believe on the issue—he won’t believe it until he sees it with his own eyes. Apart from the discovery of a cure for color blindness you’ll never win this debate. But what has actually been proven in this debate? By your inability to win the debate your friend has not disproven that oranges are actually orange. Nor has he shown that oranges are actually green. All that has really happened is that we’ve shown that a fruit that is the color orange cannot and does not exist in your friends view of the world. The above scenario is played out in lunch rooms every day, but over things far more significant than the color of an orange. There are those who insist that the Bible is a bunch of fairy tales and that God does not exist. Just as the color-blind dude in the above scenario insisted that the burden of proof was upon you, so also unbelievers insist that we must prove that God exists in order for them to believe. They will say things like “if something is true then it must be scientifically proven” even though such a statement itself cannot be scientifically proven.